The biogas production process, known as anaerobic digestion, is a recognized sustainable technique. It provides renewable methane from plant photosynthesis. In principle, the idea is to convert organic materials (biomass – usually waste matter) created by the sun’s energy, into renewable energy for use by mankind. Plus, it also recycles the nutrients such as nitrogen and phosphorus, to sustain the process in future years. All that is taken out is really just the energy and carbon, and the remaining output is as good as (or better than) it was before the biogas production process, as a fertilizer and soil improver. 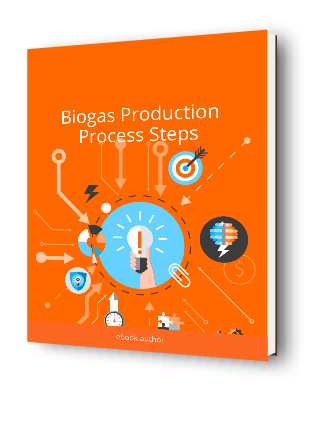 Within the biogas production process, a chain of separate unit processes (steps, or stages) must work in series without any interruptions for the biogas plant process (digestion of biomass) to take place. Thankfully that is not difficult because nature has been doing this for thousands of years across this planet. All the biogas production process operator needs to do is ensure that the digester (reactor) is given the right conditions. Get the conditions right and keep them that way, and the micro-organisms will grow and the process will run smoothly. The point of delivery of the waste (garbage) feed material is the initial organised step for the whole biogas plant. In this task the feedstock materials (usually a mixture of liquids and solids) are pumped into a large tank, known as the digester. The digester accepts the feed materials and that “powers” the biogas plant processes, which we describe in the text which follows. Download Now! No need to Sign-up, but please give us your comments! Click on the image! Odour is continually said to be a local environmental issue for all waste treatment facilities, not least for biogas plant processes. The established solution is to ensure that from the reception unit, to the digestate discharge point at the end of the process, is covered and kept under a negative pressure. All airflow is then inward and an air extraction system vents all plant air to an odor removal filter. Many such filters are themselves biological filters. Another method of odor removal is by activated carbon filter. The first biogas production process stage is the preconditioning of the feed materials (known as feedstock). The feed material is cut and mashed-up with water added comprising of a large percentage of recirculated flow from the output (digestate). For wastes which may contain meat remnants or other food waste the biogas production process will need to meet the EC animal by-product legislation requirements. This normally means that the process will need to include a pasteurization stage, either before or after the digester reactor. 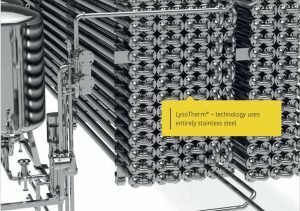 In some of the hottest digestion processes the digester may be hot enough to perform this function, but for the majority of AD plant processes currently in use, pasteurization requires heating the flow through the process in a separate heat exchanger to perform the pasteurization requirements. As most biogas plant processes operate in the mesophilic (relatively cool) temperature range the pasteurization equipment regulates the temperature of the waste materials to 70 ˚C and then back to the mesophilic temperature range. 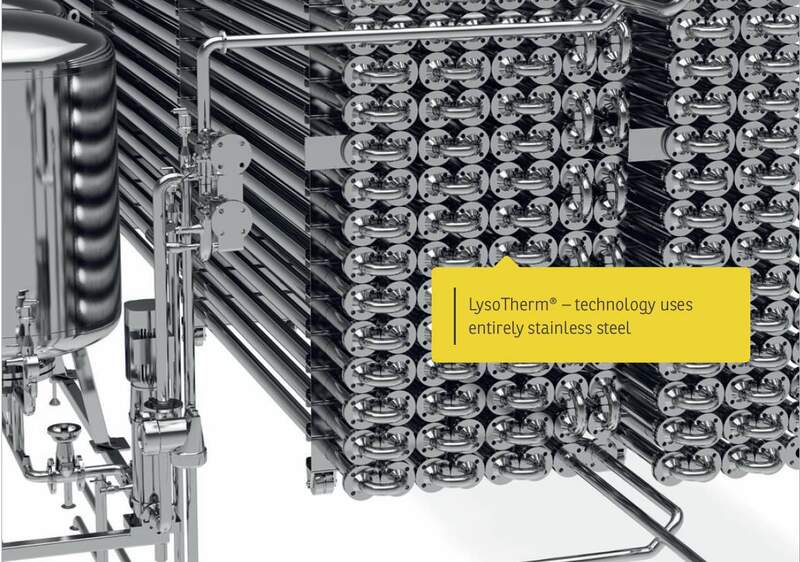 A Lysotherm Heat Exchanger – Image copyright Lysotherm. In most digesters, the first process stage sees the input flow preheated, by recirculated heat energy from outflow of the pasteurization units. With the pasteurization unit, in the second stage the sludge is heated up to 70ºC. This is done by hot water from the CHP unit (or maybe another external heat source). After being held for the required time period, the substrate (process flow) is cooled to 35-38ºC. That’s in order to keep the reactor tank, in a mesophilic temperature range digester, within the intended optimum mesophilic temperature range. The process is more rapid at a process temperature 52°C/125.6°F (thermophilic reactor temperature range) in the plant’s digester. However, in cold climates much more of the output energy at the higher temperature must be sacrificed just to keep the digester tank that hot, than at the lower temperature mesophilic range. Many process designs therefore adopt the mesophilic temperature range. for the same reason, a high degree of thermal transfer efficiency in the pasteurization stage is important to limit energy use. 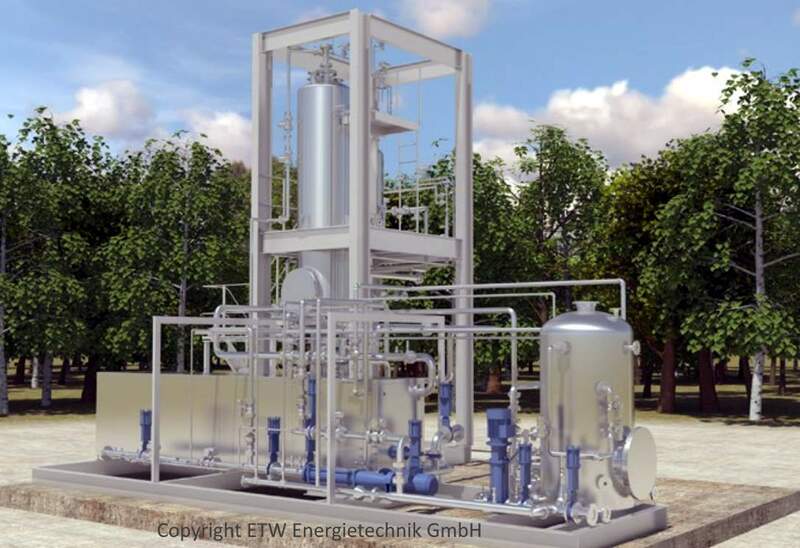 In principle for a well-designed AD process design, only 20 to 30% of the supplied heat produced in the biogas plant CHP should be consumed by the pasteurization. The pasteurization process may also be called “hygienization”. It ensures the elimination of pathogenic bacteria, but it does have the spin-off benefit that to a degree pasteurization improves also the biogas production. That is due to a small amount of hydrolysis (cell wall breakdown – lysis) taking place during the pasteurization process. Many cite the hydrolysis effect as providing about a 20% added total energy efficiency. The reaction center of the biogas plant takes place in the digester tank, where the anaerobic digestion process occurs in four separate steps: hydrolysis, acidification, acetogenesis and methanogenesis. Usually, the primary aim of the digestion stage of the process is biogas production volume and quality. However, many AD plants are also optimized for water treatment. This is the case for reactors known as UASBs (Upflow Anaerobic Sludge Blanket reactors) which are designed to clean-up the water (such as organically contaminated industrial effluents from breweries etc.) before it is discharged to the environment (i.e. to a watercourse). Another important function of the anaerobic digestion process is the production of nutrient materials (organic fertilizer). AD experts talk about the degree of “mass destruction” which takes place. The more mass destruction (i.e. conversion of solid organic content to gas) the better, and the more biogas is produced. The longer the substrate remains in the digester tank (the retention time), the more will be the mass destruction. However, a biogas production slow-down occurs if the substrate remains in the digester for too long. The actual time of retention of the biomass in the digester is finely balanced to gain the best gas-output to mass-destruction balance. The mass conversion to gas (mass balance of the whole biogas plant) varies according to the type of feedstock. Biogas crops and food waste give the best conversion rates/ most biogas. Manure and sewage sludge give the least. Rates vary from approximately 5 to 10 % for manure to, up to 40% for some food wastes. Within the digester there is a need to ensure that a generally neutral pH is maintained, otherwise the gas production may slow down or halt. For some feedstocks the rate of production of hydrogen sulphide may also need controlling. Many researchers have also reported that the digester ammonia concentration should be kept below maximum levels. Those reporters say that limiting ammonia concentration is essential, while others say that this is not a problem. The biogas production stage takes place over a retention period of about three weeks. In many biogas plants, the gas is purified (upgraded) before it is used, by removing impurities and carbon dioxide. Finally, a proportion of the substrate is allowed to flow out from the biogas digester as substrate flow, and the portion not recirculated (to add water to the incoming preconditioning mash-up) flows out. This fraction, is called the digestate. The digestate is again (like the mash which entered the digester) a slurry, and contains both fluid and fibers. The usual way to process the digestate is to separate the liquid from the solid part. This may be done either by mechanical dewatering, or by simply leaving the outflow of digester to drain so that the free liquid pours out, and is collected. The liquid part is used to produce precision liquid fertilizers. The fibrous material is usually composted in the same way (in windrows) as aerobic compost. Once it is largely free from odor, after about 3 to 4 weeks, the fiber digestate is used as a soil improver/ conditioner. 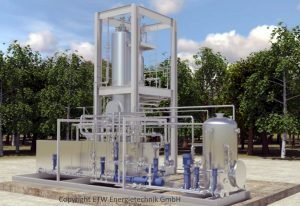 The energy process which takes place in a biogas plant is functionally similar to an oil refinery, which produces a usable fuel and methane can be further processed to make more complex hydrocarbon based chemicals, which can be used to replace their oil based equivalents and make plastics etc. It is therefore unsurprising that anaerobic digestion process experts have coined the term “biorefinery“, to describe the larger AD Plant facilities. Where the digestate is dewatered mechanically, this may be done by a “decanter centrifuge” or a “screw press”. Dewatering is applied depending on the digestate characteristics, and the required nutrient balance between fertilizer products. Digestate fiber typically has a dry solids concentration of 25-30 %. From a nutrient point of view it normally contains a 1:1 ratio between nitrogen and phosphorus. The proportion of liquor (process fluid – mostly water) is of higher volume than the fiber portion. Most of the ammonia in the output is in the liquor (liquid digestate) together with a low concentration of phosphorus. Ammonia concentration in the reactor is controlled against becoming too high in the digester, by the amount of output liquid. The normal/ most common anaerobic digestion production process, is the type of Continuous Stirred Tank Reactor (CSTR) design described here. The flow progresses through a sequence of stages, from preconditioning of the feed to pasteurization, and digestion in the main digester tank. Biogas and digestate (fertilizer) are the biggest outputs by a wide margin, and the biogas production process can quite reasonably be given the proud name of ‘biorefinery”. To view the above Biogas Production Process Innovations on the YouTube website click here. Thank you a lot for giving an extremely good opportunity to read this site. Did you see the “Greenage”? They cover many other green energies. Not just the biogas.